women on the Pentacrest. The press conference Sunday, Oct. 24, also made it clear to me that the organizers were attempting to exclude men just because they were men. One of the spokeswomen said that women at the event had more of a right to be in the park than any men had. 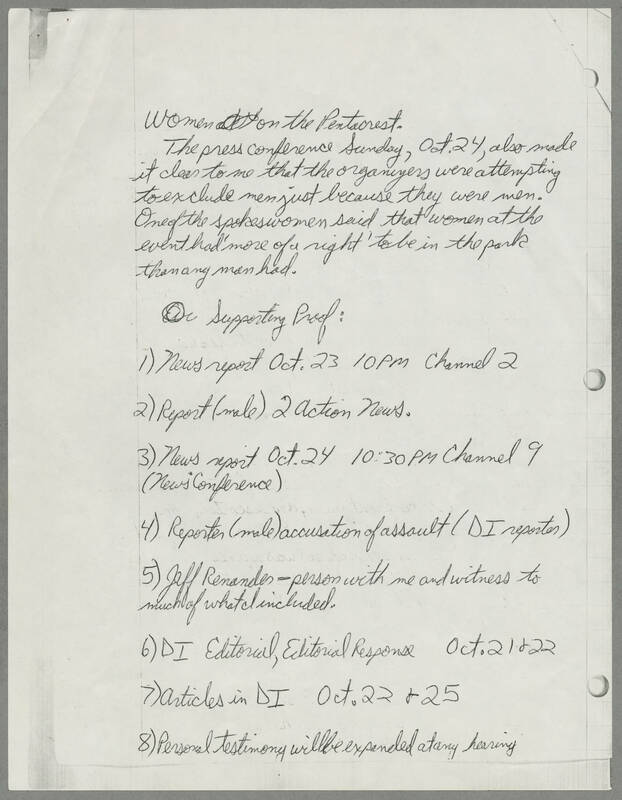 Supporting proof: 1) News report Oct 23 10pm Channel 2 2)Report (male) 2 Action News 3) News report Oct 24 10:30PM channel 9 (news conference) 4) Reporter (male) accusation of assault (DI reporter) 5) Jeff Renander--person with me and witness to much of what I included. 6) DI editorial, editorial response Oct 21 + 22 7) Articles in DI Oct 22 + 25 8) Personal testimony will be expanded at my hearing.